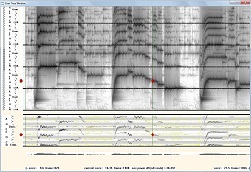 The software, written by me (Norm Spier) for my own experimentation, supports looking at musical sounds, both live, and from recordings, via mainly spectrograms. This lets you look at both the fundamentals of musical sounds, and overtones. It differs from some of the best similar software I've seen in that it adds various forms of aural feedback, so I've decided to put it out there for anyone interested to use. The software does some very decent analysis on live sounds, but what it does on sounds from recordings (.wav) is much more extensive. View the musical spectrum (tones and overtones) in synch with the sound. Fundamentals and overtones can be displayed in relation to the key of the music (i.e. relative to tonic and pitch degrees). Aural Guidance type 1: MIDI-generated note-sound feedback on pointed-to spectral position; and also you can use your computer keyboard MIDI keyboard of 36 notes organized relative to tonic of set key. 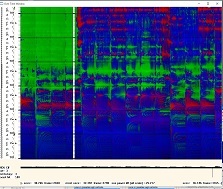 Aural Guidance type 2: You can SING OR HUM and superimpose that pitch over the corresponding height on the spectrogram. Includes octave-overlay mode, and other chord/key help, to help determine key and chords. Exact relative powers and pitches/frequences can be examined. 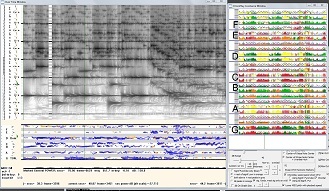 For STEREO recordings with instruments in different locations, there are several spectrogram options showing also the position (L/R/Center) of the sound. NOTE: Basic Spectratune (no-"Plus"): If your needs are limited to looking at LIVE (not recorded) sounds, your needs might be filled by my old Spectratune software, which this extends, and which has been around since about 2008. It has a simpler interface than this software. 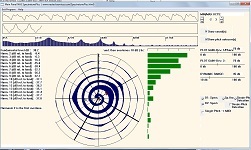 Here is a link to the old Spectratune: Spectratune Software.